​Have you been looking for the best chrome polish online and haven’t had much luck? Chrome, stainless steel, brass and other metals lose their luster over time, exposure to the elements and other factors. Rust, corrosion, etc take its toll on and lead to deterioration, rendering the metal useless and unsightly. That’s where chrome polish comes in, though the challenge is figuring out which ones to buy. To make it easy for you, I have reviewed the top chrome polish online. I compared the various chrome polish products online and picked out the best of the bunch. Aside from the reviews, I have also included other essential information. ​Chrome, no matter what type it is, isn’t going to endure without the right polish. Time, usage, exposure to the elements, sooner or later it’s going to wear out. With a high-quality polish, you won’t have a problem restoring its appearance. These polishers also double up as cleaners. They don’t just make the chrome look shiny, but they also remove dirt and grime. This saves you a lot of trouble and reduces the amount of maintenance you need to do. These polishers are also suitable for cleaning metals with oxidation. Oxidation is a common problem, and if not handled properly will cause all kinds of problems. That is the reason why you need chrome polish. With regular application, it’s going to restore the chrome’s appearance as well as prevent early deterioration. The bottom line is this: if you own a car or motorcycle, a high-quality chrome polish is necessary. This is the most effective means for making sure that the material is clean, clear and not vulnerable to rust, corrosion or other issues. The California Gold All Chrome Quick Polish is an all around product designed to work with different types of polish. Available in single 12 oz and a pack of 6, you can use this to protect, polish and clean decorative or hard polish. The All Chrome works on chromed plastics, PVD chrome as well as chrome plating. You only need to use a small amount of this spray polish to clean and protect chrome. As an all-around product it’s ideal for car parts, accessories and other items with chrome. ​Customers agree the all Chrome removes bugs, dust, fingerprints and small water spots. They also say the spray creates a barrier that protects the material. Just spray on the surface, wipe and buff. It will only take moments before the chrome starts getting shiny, customers say. ​The No7 Chrome & Metal Polish is an all-around polisher and cleaner. A single application cleans and polishes surfaces, reducing the amount of time you have to clean up. Applying on trim and chrome bumpers leaves a mirror shine that lasts a long time. The No7 Chrome & Metal Polish is ideal for chrome, but you can also apply it on stainless steel, copper, brass and nickel. The polish also excels in the removal of rust stains, bug residue and traffic film on various surfaces. ​The No7 Chrome and Metal Polish has received mostly positive reviews. Majority of customers agree that it is very effective on wheels. Others say the polish cleans chrome even if it hasn’t been cleaned in a while. This is a view shared by most other customers, pointing out the No7 gets rid of dirt and grime. ​With a small application of the Killer Chrome, you’ll notice the difference as chrome gets cleaner and shinier. It contains a unique formula that quickly removes dirt and rust. By applying a small amount, chrome assumes a mirror-like appearance. The Killer Chrome gets rid of stains as effectively as it does rust. The polish is especially good at restoring bumpers that have been tarnished. The Killer Chrome can be applied by hand or machine, but either way it works as doubly fast as the typical paste machine. While the polish is meant for chrome, you can also use this on stainless steel and aluminum to great effect. ​Customer reviews have been mostly positive. Most of them agree it leaves a nice shine on chrome. They point out that it is an effective polisher and cleaner and that it works on many types of chrome. ​The Star Brite Chrome & Stainless Polish is one product that lives up to its name. Its ingredients have been specially prepared to give chrome and stainless steel a deep, mirror-like shine. You only need to apply a bit of Star Brite, wipe and see the results. The shine looks especially good on chrome wheels and trim. Even with a small amount of Star Brite you’re going to realize that it’s still going to provide a lot of shine. The Star Brite polish is just as potent for stainless steel, so it’s an ideal polisher cleaner. ​The feedback from customers is mostly in its favor. They agree that that the Star Brite polishes chrome and stainless steel and removes tarnish. These customers also like how quickly the polish takes effect compared to other polishes. The polish has also gotten a lot of good feedback for its restorative properties. ​The California Gold Chrome Polish has been formulated for optimum results and its shows. It just takes moments to apply the California Gold, and you’ll see the difference as the surface becomes clearer and brighter. This isn’t just an ordinary polisher as it also doubles up as a cleaner. The California Gold is easy to use, and it only takes seconds to see the results. The California Gold shine also lasts a long time so you don’t need to apply it frequently. The shiny, glossy effect is similar to what you’d see with a showroom car. Moreover, the polish keep metal spots at bay. ​The California Gold Chrome has received a lot of positive reviews. Most of the customers have remarked about how quickly it restores shine on rusty metals. Customers often use the polish for their cars, and it has proven effective time and again. ​The Pro 40 Perfect Metal Polish was designed so it’s easy to use and applicable for different surfaces. The process is straightforward: wipe on the chrome, allow it to dry and wipe off. Once you’re done applying, the chrome will have a clear shine like it’s brand new. The Pro 40 has been specially formulated so the surface looks shiny. The polish works fast too so you’ll be done in half the time. One of the nice things about the Pro 40 is that the polish lasts, making this ideal for maintenance. Since each application lasts a long time, you don’t have to do it repeatedly. ​The feedback has been favorable. Customers say the Pro 40 is very effective, and that it works well on cars, motorcycles and anything with a chrome finish. Other reviewers say the Pro 40 does an excellent job of removing corrosion. ​The Turtle Wax Chrome Polish uses a special formula to restore the shine on tarnished, rusty chrome. With proper application, the Turtle Wax will restore its shine like before. The Turtle Wax is compatible with different types of chrome components, wheels, and chrome bumpers. The Turtle Wax is easy to use. You can use foam pads, microfiber or cotton, any of which will produce the desired results. What the Turtle Wax does is provide a protective barrier so the chrome finish does not oxidize anymore. For rust, corrosion and dirt removal, the Turtle Wax works. ​The Turtle Wax reviews have been generally favorable. Many customers say it works even better than they thought. Most use the Turtle Wax to remove rust and corrosion. Other customers expressed satisfaction at how quickly it removes rust. There were some who were skeptical at first but were won over by the polish’s efficiency. ​The 3M Metal Polish has been formulated to restore chrome to its original luster. Its ingredients work with copper, bronze, brass, stainless steel and other car metals. With the 3M you’ll be able to restore tarnish, remove corrosion, water spots and oxidation. You only need to wipe a small amount of polish before getting the desired results. The 3M Metal Polish works very well on bumpers, trim and wheels, and it also reduces metal pitting. After the dirt and grime are removed, spot is eliminated, restoring the metal’s sparkle. ​The 3M has received a lot of favorable feedback. The majority of customers say the polish removes rust and corrosion, taking just seconds to work. Other customers like its cutting action and how it manages to restore luster. The general response is the 3M does what it claims to do and more. ​The Blue Job Exhaust Polish has special ingredients for polishing chrome exhaust and other metals. Simply wipe the metal and it will have a new shine. The formula is especially suited for chrome so it’s safe to use. You can also apply the Blue Job on stainless steel and other metals with the same results. What makes the Blue Job more effective than others is the polish takes effect rapidly. It brings the shine and sparkle back quickly while cleaning the object. Regular use of the Blue Job also keeps exhaust in good working order. ​Since its release, the Blue Job Chrome Exhaust Polish has gotten a lot of positive feedback. Most of the positive feedback is directed at its efficiency. Many reviewers have pointed that it only takes a little while before the Blue Job takes effect. Other customer agrees and says it’s a potent exhaust rust remover. ​Gord’s Chrome Polish was formulated specifically to restore the luster of rusty chrome. What this polish does is remove the undesirable elements on the surface. This includes tarnish, rust, corrosion, water spots and oxidation. The polish also serves as a protective coating for the surface so it doesn’t deteriorate. The polish is easy to apply and it doesn’t wear off easily. Its formula is primarily for chrome, but Gord’s also works for other metals. You just use the same method and you will get the same results. As a polisher, you will immediately see how reflective and shiny the surface is. ​The reviews for the Gord’s Chrome Polish have been very positive. Most of those who have tried it say the formula works very fast. The customers also agree Gord’s Chrome works fast and delivers results. Most of the customers also happy with the amount of shine the polish restores to chrome and other metals. If you look up chrome polishes online, you’re going to find a lot of products all claiming to be the best. But as I am sure you know, not all chrome polishes are made the same way. Some are very effective while others are not. To make things simpler, you need to consider the following. A good chrome polish needs to be compatible with different types of chrome. The greater the compatibility level, the easier it’s going to be to restore the luster on the metal. Using a polish on something that’s not meant for chrome may cause damage. Compatibility should not be limited to just chrome. If the polish works on aluminum, stainless steel, brass, copper and other metals, that’s even better. Rather than buy a separate polisher or cleaner for your other metals, it makes more sense to purchase an all-around cleaner. The quality of a chrome polish is measured in how well it restores the luster and sparkle of chrome. A well-made chrome polish should make chrome and other metals look shiny, something like a mirror or what you see in a car showroom. The good news is you no longer have to spend a lot of money to get a good chrome polish. Is the polish safe to use on chrome? Make sure the product you use is not going to cause any problems. While the goal is to restore the shine and sparkle to metal, it must not compromise the metal’s finish and durability. One of the most common mistakes customers make is just assuming that polish is only for beautifying chrome. It’s true that polish does that, but they’re also made to protect the metal from corrosion, water spots and other undesirable elements. Look for a polish that’s designed to provide utmost protection by making sure that there is a protective barrier against rust and corrosion. By longevity we mean two things: the duration of the polish and how long you’ll be able to use a single bottle or container. A well-prepared chrome polish should last for a long time. The longer it is able to last, the more practical it is. Polishing can be taxing so the less time you have to do it the better. The other benefit is you don’t have to spend a lot of money buying new chrome polish. How easy is the chrome polish to use? How much effort does it require from you? The ease with which you can apply the polish cannot be set aside. This becomes especially important if you have to polish a lot of these materials. ​1. How long does it take for chrome polish to work? ​Answer​: It usually takes just a single application to restore the luster. However, it might take several applications if the metal is very rusty or dirty. 2. ​​​Does chrome polish also work for other metals? ​​​Answer:​​​​​​​ Most of them, yes. The majority of chrome polish can be applied to stainless steel, aluminum and brass. Some chrome polish work on only on certain types of metal so read the product description first. 3. Do I need to use special cloth for chrome polish? ​Answer: ​You can use any soft, clean cloth. Some of these products come with foam pads or microfiber. ​Whether it’s wheels, trim or motorbike or exhaust, chrome and other metals will rust and corrode. However, you don’t have to put up with that since there are a lot of quality polishers and cleaners available. Hopefully, this guide was able to help you make that decision. 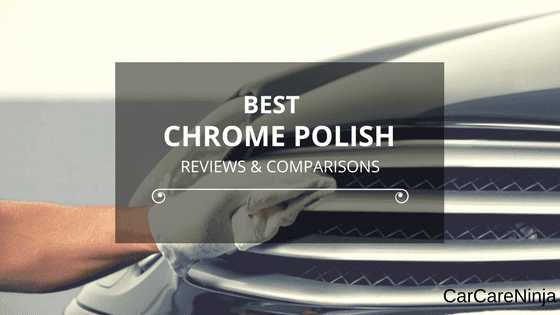 So which of these products can be called the best chrome polish? They’re all quality products, and the positive feedback they’ve been getting is a testament to their design. However, we all have preferences and some may prefer one over the other. That’s the reason why I leave it up to you to decide what is the best.